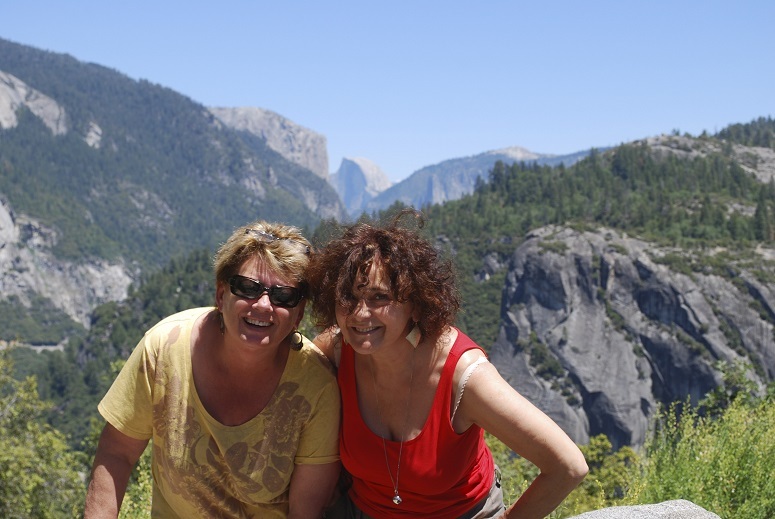 Roberta is a warm, caring, informative, energetic travel guide and Feldenkrais practitioner. Her unique way of presenting ideas and history are inspiring. Along with her historical knowledge she is a Feldenkrais Practitioner. Her practice of the Feldenkrais Method and Mindfulness inspire her as a guide into the outer and inner world. This combination is informative, and inspiring. I hope you get a chance to enjoy her presence. She will create a memorable journey for you and your loved ones. What an incredible experience it was to meet Roberta Teresi in Sicily in 2012. Roberta has a wonderful, outgoing personality, and it was immediately apparent that we would have a wonderful time together. Her knowledge of history and her command of the English language are both excellent; far superior than that of any tour guides we have hired. Little did my wife and I know that Roberta would change our lives forever. Roberta was our tour guide in Sicily in 2012. I had spent the previous 10 years doing genealogy research to trace my Sicilian relatives. We hired Roberta to take us to visit several small villages in Sicily. Roberta only knew that we wanted to visit three villages; at the time, I had not given Roberta the names of my relatives. Roberta took us to the first village, Poggioreale, which had been destroyed by an earthquake in the 1960s. She spoke to many people in the village and was able to find the architect who was leading the movement to rebuild the old town. Because of Roberta, we were able to get into the fenced-off locked town, and get a 3-hour private tour! As I said before, Roberta speaks English beautifully and provided the translation for us. The next stop was the little village of Caccamo. I knew there were relatives from that village from records I had from the late 1800s. Again, Roberta stopped and talked to several people, and one man recognized the family name. We followed the man to a store, where we met several people. Unfortunately, they were not related. The story does not end there, even though, sadly, it was time for us to return home. Roberta asked for copies of my research before we left. Roberta was able to access records that were unavailable to me and worked as though she was looking for her own family. By the time we arrived home, Roberta had news for us. She was fairly certain that she found relatives. She worked very hard to connect with the relatives, even going so far as to drive back to Caccamo so she could meet with them. She encouraged two of the relatives, who spoke a little English, to contact us by Facebook. She alleviated their fears that they couldn’t speak English well enough to communicate with us while at the same time provided encouragement to us even though we couldn’t’ speak Italian. Once we began communicating, Roberta remained in contact with all of us. Needless to say, we returned to Sicily in Fall 2014 and, with Roberta’s help, had the trip of a lifetime. Roberta helped coordinate meeting the relatives by providing translation and also by giving good advice. We met and stayed with the relatives in Sicily, and met with additional relatives in Tuscany. It was truly an incredible experience, and would not have happened without Roberta. Our new family held a party for us, and over 60 people (many of them were relatives) attended. There was traditional Sicilian food, Sicilian folk music and folk dancing. Most amazing of all was a huge sign welcoming my wife and I into the family. It was true, through her excellent research, great communication and people skills, we had “new” family. We can’t thank Roberta enough for making our dream come true. We highly recommend Roberta Teresi, both as a tour guide, and to help find relatives in Italy. Please feel free to contact me at the email address below if I can answer any questions. Roberta Teresi is an outstanding and exceptional tourist guide. In the five years that I have known her, and the times I have used her services, she has always exceeded my expectations and that of my group. Enthusiastic, knowledgeable, highly dependable, conscientious, highly motivated and displaying an energetic self-starter personality is how I would describe Roberta Teresi. Regardless of all other factors consistency over time seems to me the true mark of measuring achievement. Today people are given praise for things they are paid to do, are supposed to do, and many times it is for a mediocre effort or for a one time event! Roberta, however, has consistently been a person who achieves optimal levels of personal performance and accomplishment. She has done several tours for me when I hosted American tourists in Sicily. Her extensive travel and work in different parts of the world add immeasurably to the quality of her presentation, and bring an unparalleled expertise to her effectiveness as a guide. In fact I have told my groups how fortunate we were to have a person of her diverse background to explain the melting pot of culture, religion, folklore etc. that is the city of Palermo. On one particular trip I had a priest who had studied in Europe and he said, “I learned some things I didn’t know from her.” A retired history teacher, also on the tour exclaimed, “I could have listened to her for a couple more hours.” These comments are illustrative of the feedback that I get about her after the tours. Her anecdotal stories are insightful and add a new dimension to her information. Especially noteworthy is her commitment to the client and attention to detail. In 2009 I was asked by a family to organize a trip to Sicily for their family and close friends. They were especially interested in visiting the town of Agira to trace and see the hometown of their ancestors that came to America. When I called Roberta she informed me that she could also provide genealogy service. When the group arrived in 2010 she had researched their name, called the local priest in Agira (to make the church records available) and had made contact with a local retired historian in the town. The day we arrived in Agira we were met by the historian and given a presentation at the town hall about the family name and about their relatives, and surprise — the location of their relative’s home was found in the old part of the town. It was a magical moment when they went to see the location of the old house and imagined the people that left so long ago. With Roberta’s help the family was able to fill in the blanks of their research and with the church records find their relatives from 1790! In conclusion I’ll say this about Roberta. On one occasion I changed the arrival date of one of my trips because she was not available.